Athleisure—it’s cool, casual, and dare we say, comfortable? With the new wave of loungewear meets street-chic, dressing to impress no longer means feeling buttoned-up. And this doesn’t just extend to the ladies out there, gentleman—we raise you a raglan tee and a pair of jogger pants! Here’s how to stay comfy, casual and cool for the guys & gals. Take your casual, everyday look up a notch to an elevated status that keeps you looking easy, breezy and cool. Sneakers are not gym shoes (and vice versa!). Treat yourself to a pair of elevated, luxe sneakers (in leather or canvas) when you’re in the mood to kick it. Pair them with your favorite joggers or leggings for an updated take on casual dressing. A lightweight button-up in a cotton or a linen blend is the perfect piece to wear with your favorite jeans or leggings. The more loose and flowy—the better! If you’re going all in on casual dressing, a little wrinkle here and there is a good thing. It builds character! Instead of sweatpants try a pair of joggers in a fabric like viscose or a silk-cotton blend. They’re perfect for pairing with a blouse or a basic tee. Plus, they can even be dressed up with ankle booties if need be. Leggings are so comfortable, but can they really be worn in place of pants? The answer is yes—with some considerations! Make sure they’re opaque in nature (no see-through, please!) and err on the side of athleisure, not gym bunny. Then, pair them with a loose button-down (see #2 above), a graphic pullover and all-white kicks for the perfect off-duty outfit. It’s Stylist-approved! If the T-shirt and jeans combo is too cool-weather for you, layer up with a pullover sweater for the same ready-in-5 outfit. Not feeling jeans today? Give your look a feminine twist with a spring-ready floral skirt, then slip on your sneakers (see item # 1) and go! Style + comfort. Who says you have to choose? 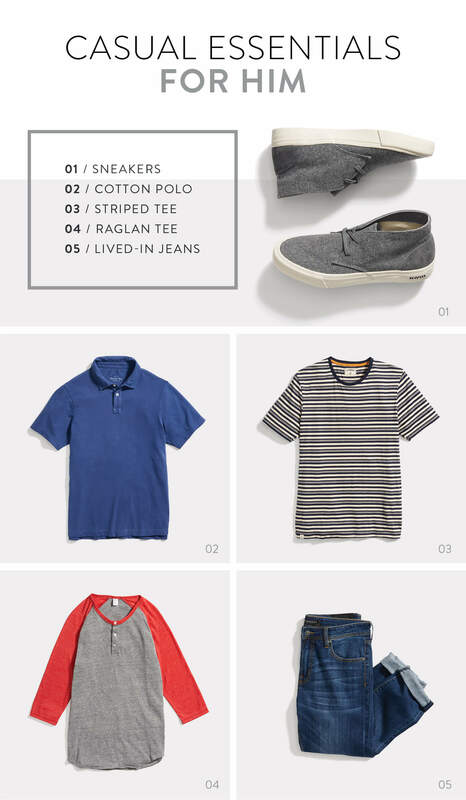 Here are the 5 essentials every guy needs to stay cool and casual all year long. So fresh, and so spring clean. A pair of crisp, all-white sneakers always keeps your look on-point. They’re timeless, and every dude needs sneaks that can go the distance. Wear yours with everything from bold prints to a casual suit. The quintessential polo! It’s one of the most functional pieces in a guy’s closet and can be paired with pretty much anything in your wardrobe. A trim polo has the status of “forever cool”―so stock up on a range of bright and muted color options. You can never have enough tees, right? Freshen things up by adding in stripes to break away from your sea of basic tees. Rock yours with an unstructured blazer for an upgraded casual look or stick with your best broken-in chinos for maximum chill vibes. Every guy has that shirt he never wants to take off. The classic raglan baseball tee―in a seriously soft blend―is that shirt. Its stand-out construction can be worn with your most-trusted jeans or your coolest slub shorts. Throw on a comfy raglan for your next AM coffee run or grabbing a game with the guys. Jeans: they’re made to be lived-in. As a go-to staple for most guys’ daily style, it just makes sense that your denim is flexible with some forgiving stretch. Grab a pair that moves with you, and you’ll have the perfect set-up for casual comfort and mobility. P.S. Looking for more men’s style advice? 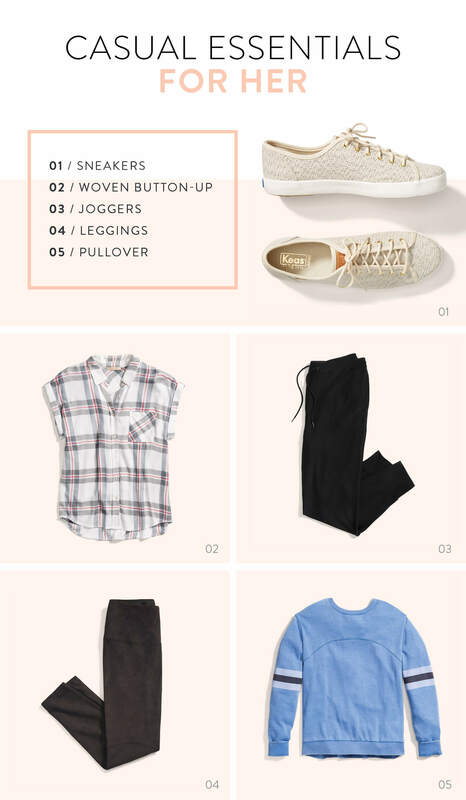 Check out the Stitch Fix Men’s blog and sign them up for a Fix! Are you on board the casual express? Tell us how you elevate your basics in the comments!